Since the dawn of Photoshop, image altering has been a controversial topic among professional photographers, their subjects, and their public audiences alike. Transforming images to blur the line between fact and fiction has become a common occurrence in all realms of entertainment and news around the world, from tweaking a model’s look on a magazine cover to inserting realistic aliens and monsters into blockbuster films to altering photos of missile launches to create threatening propaganda. However, what many people don’t realize is that the falsification of photographs started long before Photoshop made it as easy as the click of a mouse. Faked photographs have been around almost as long as photography itself. The invention of photography presented a new medium for hoaxers and manipulators to transform images to fit their needs. Whether a hoaxer’s intention was hurtful or humorous, the new technology of photography presented an unprecedented opportunity: a way to create images that looked so real that people had no choice but to trust them. From its inception, photography and hoaxery went hand-in-hand, like Bigfoot and the Loch Ness Monster. Since the 19th century, people have been manipulating images, combining negatives, staging scenes, and building dummies to trick audiences into believing that what they see in the image is real. Here’s a list of some of the sneakiest, scariest, and silliest photographic hoaxes throughout history and how the hoaxers created these famous images. One of the most infamous photographic hoaxes in history all started because a little girl didn’t want to get in trouble. In 1917, Frances Griffith returned from a brook with wet feet and wasn’t looking forward to the inevitable punishment. When her mother asked her what happened, Frances told her mother that she went to see the fairies. In a show of familial solidarity, Frances’s cousin Elsie backed her up and agreed that fairies played down by the water. With the adults obviously dubious, the girls took a camera to the brook and came back with proof – pictures of both girls with fairies and gnomes. After both girls’ moms shared the photos around, the pictures sparked a public phenomenon. Even Sir Arthur Conan Doyle, creator of Sherlock Holmes and a famous spiritualism supporter, weighed in on the photographs, believing them to be genuine proof of humanity’s ability to commune with the spirit world. How They Did It: Almost 60 years later, Frances and Elsie finally admitted that their photos were fakes. Elsie had art training and drew the figures on paper. The girls fixed the drawings to hat pins and stuck them in the ground for the photographs. Then, they destroyed the evidence in the brook. A hoax so simple that a child could do it. The Big Foot spotted at Bluff Creek in 1967 is the most famous sighting of the infamous creature ever recorded on film. Two men, Roger Patterson and Bob Gimlin, trekked into the California wilderness in search of the monster, with a rented camera and plans to make a documentary about their experience. Wouldn’t you know it, they spotted a female Big Foot striding through the forest. Patterson managed to capture footage of the creature before she disappeared back into the trees. Patterson died of cancer a few years later and went to his grave stating that the whole story was true. How They Did It: The Big Foot in the video looks like a costume purchased straight off a Halloween store rack, and it basically was. After a TV special about the case aired in 1998, a man named Bob Heironimus came forward and admitted that he had been the man in the suit. Patterson hired him to play Big Foot in a short film that he planned to sell. A costume designer named Phillip Morris also stated that he was the one who sold Patterson the suit. His company Morris Costumes is now a massive costume manufacturer that supplies Halloween costumes across America. The modern fervor over the Loch Ness Monster came to a head with a photo taken in 1934. Known as the Surgeon’s Photo, the most famous image of Nessie was taken by British surgeon Colonel Robert Wilson. It shows a creature with a long neck rising out of the water. For more than 50 years, the picture stirred up a fervor about what swam beneath the surface of the Loch. How They Did It: The picture stood as a testament to the existence of the marine creature until 1994, when a man named Christian Spurling confessed to his involvement in the hoax. The Daily Mail previously hired Spurling’s step-father, Marmaduke Weatherell, to find the Loch Ness monster and Weatherell felt betrayed when they debunked what he found. So he set out on a plot of revenge straight out of an episode of Scooby Doo: he and Spurling constructed a model out of a toy submarine from Woolworth’s with a sculpted head attachment and photographed it. They sent the photo to Wilson, whose pedigree made him a trustworthy Nessie spotter, and Loch Ness was never the same again. The corpse which you see here is that of M. Bayard, inventor of the process that has just been shown to you. As far as I know this indefatigable experimenter has been occupied for about three years with his discovery. The Government, which has been only too generous to Monsieur Daguerre, has said it can do nothing for Monsieur Bayard, and the poor wretch has drowned himself. Oh the vagaries of human life…! In 1936, photographer Robert Capa released an image that encapsulated the horror of the Spanish Civil War and went on to become one of the most famous war photographs in history. It also helped kickstart Capa’s career as a famous photographer. The image captures a Spanish soldier, Federico Borrell Garcia, as he takes a fatal shot. How They Did It: The story of Capa’s photos started to unravel when other images in the same series were released. Academics studied these photos next to this most famous version and determined that Capa did not snap these images near Cerro Muriano in Andalusia as he claimed. Instead, the photographs were taken near Espejo, a place that the war didn’t reach until after Capa published the photographs. A jewelry engraver named William Mumler was the first enterprising mind to combine the emerging fields of spiritualism and photography for profit. Mumler’s hobby for photography paid off one day in the early 1860s when he sat for a self-portrait. He discovered a ghostly figure standing behind him as he developed the photo, which he originally believed to be the remnants of a previous image. He showed the photo to his friends on a lark and, based on their credulous responses, went into business as a spirit photographer soon after. Mumler’s fame grew so large that his photographs appeared on the cover of the national magazine Harper’s Weekly. Although his contemporaries were skeptical, no photographer could find any evidence that Mumler faked his ghostly photo shoots. Despite his detractors, he had at least one very famous fan. In what would be her last photograph, Mary Todd Lincoln sat for a photo with him, Abraham Lincoln’s ghost visible behind her. How They Did It: Skeptical photographers both then and now ascribe Mumler’s spooky shots to one of two methods. One possibility is double printing, when the subject and the spirit appear in two different negatives that the photographer later combines. The other is double exposure, when the person designated as the ghost leaves the picture mid-exposure to produce a transparent, ghostly effect. Mumler ensured that no one would ever know for sure when he destroyed all his negatives shortly before his death. In 1933, war widow Gladys Cockburn-Lange contacted publishers with a fascinating document. She gave them the war diary of her dead husband, complete with stunning images of World War I planes in action. The book Death in the Air: The War Diary and Photographs of a Flying Corps Pilot was a hit, especially influential because so few photographs of World War I aerial combat existed. How They Did It: Gladys Cockburn-Lange couldn’t have had a more British sounding name if she chose it herself. Oh wait, she did. Gladys was actually Betty Archer, the wife of Wesley David Archer, a Hollywood-employed model builder. Wesley Archer built the models in the photograph and superimposed them over aerial photographs to create the hoax. The National Air and Space Museum finally exposed the hoax in the early 1980s. At the height of her success, Ada Emma Deane’s spirit photographs incited bidding wars from national newspapers for the rights to publish them. An unassuming cleaning lady before she got her hands on a camera, Deane’s claims to fame were the disembodied heads that appeared in the pictures that she took. She created a famous series of commemorative photos of World War I Armistice day and by the fourth year, newspapers fought for the exclusive rights. How They Did It: Deane’s first giveaway was her requirement that she receive photographic plates in advance of the photo shoot. In 1924, the same newspaper that bought her Armistice Day picture also debunked her hoax. They revealed that the floating heads in her picture were not dead soldiers but were very much alive, including the faces of some well-known athletes. She maintained her innocence, claiming that she if she were faking it, she wouldn’t be so stupid as to use such recognizable faces. In a very fortuitous coincidence, UFO enthusiast George Adamski got the photo of his life when he captured the image of a foreign spacecraft flying over his California home in 1952. He gained a loyal following in the UFO-hunting world and wrote a number of books about his encounters with the third kind. At the height of World War II, the U.S. Army Office of Public Relations released a brief that caused panic across America. They shared images taken by airplanes of three “secret markers” that seem innocuous from the ground. But the brief reveals that, in the air, the markers point directly to strategic locations like factories and airfields. The government wouldn’t reveal specific locations but assured concerned citizens that the markers were destroyed and warned them that this was evidence that the enemy could be anywhere. The pictures made it to the front page of every major newspaper in the country. How They Did It: The “markers” were nothing more than innocuous shapes on the ground: a bird feeding area, a configuration of fertilizer sacks, and the remnants of a plowed field. The government actually investigated the markers months before and determined that they had no military significance – until they realized their benefit as propaganda, that is. In 1974, art critics and museums fawned over a recently uncovered set of Victorian photographs by unknown talent Francis Hetling. The photographs show Victorian orphans in a natural setting, a welcome change from the staged photographs that other Victorian photographers tended to take. Hetling’s pictures got so much buzz that the National Portrait Gallery in London even displayed some of them. How They Did It: Despite the investigations of numerous experts, it was a fluke that exposed the hoax. A man who saw the photographs recognized one of the children as the child of a friend, a child who was very much still alive. In the end, it was an ad man named Howard Grey who took the photos and got his friend Graham Ovendon to make them look old. In a theatrical display that included screams and distorted facial features, Ted held a tube he called a “gizmo” in between his head and a Polaroid camera. When the Polaroid image appeared, it contained a faded, blurry figure of one of Ted’s “thoughtographs,” like a car or a building. A psychiatrist took an interest in his work and published a book about him, which led to an article in Life magazine. How They Did It: The key to the hoax probably rested in the one part of the scheme that Ted controlled – the gizmo. Professional magician and skeptic James Randi suggests that Ted probably slipped a lens containing a photograph transparency into the gizmo before he took his photos. Randi was able to recreate the procedure himself with his suggested method. Reported widely in Bangladeshi and Indian newspapers, the discovery of a giant human skeleton in Saudi Arabia in 2004 had wide-ranging implications on those that believed the hype. The picture of a normal-sized human excavating a massive human skeleton went viral and internet users around the world saw it. Religious folks believed that this could be physical evidence of the giants mentioned in the Biblical book of Genesis. How They Did It: This is one of only two digitally altered photographs on the list, but for a hilarious reason. In a meta twist on hoaxery, Photoshop wizard “IronKite” created the image for a contest called“Architectural Anomalies,” which challenged entrants to “show a picture of an archeological discovery that looks so real, had it not appeared at Worth1000, people might have done a doubletake.” In other words, he created a fake hoax that accidentally became a real hoax. If he didn’t win the competition, he definitely should have. In the 1800s and early 1900s, spiritualism was the latest fad. Mediums, claiming that they could communicate with the spirit world and prove the existence of ghosts, held seances attended by thousands. One trick of the medium trade was their ability to produce “ectoplasm,” a strange, viscous substance that oozed out of a medium, through which the medium could manifest spirits. It sounds weird, but people were fascinated by it. A number of mediums employed ectoplasm in their seances, producing faces of the dead inside their ectoplasm, and dozens of pictures of these seances still exist today. How They Did It: It was nothing more than a magic trick. Mediums hid cheesecloth, gauze, papers, and even animal parts on and in their bodies and could then reveal them on cue. Whether a medium had the cheesecloth up her sleeve and slid it out or swallowed and regurgitated it, their skills at slight of hand are what produced the effect, not spirits from another world. In the 1930s, medium Colin Evans became famous for his levitation abilities and drew large crowds to his shows. Photographs of the events show Colin levitating in mid-air as believers hold hands around him. Colin held a string in his hand that attached to the flash so that he could control the camera apparatus himself. With the flash of a bulb, Colin captured himself hovering as if by magic. How They Did It: Colin’s technique was so crude it’s almost embarrassing for those people who believed his hype. According to reports from the time period, Colin conducted his seances in complete darkness. Colin didn’t care a bit about his in-house audience because all he wanted was the photograph. The only light came from the momentary flash, which caught him at the peak of his leap and created a very rudimentary levitation effect. As horror movies love to teach us, children are just the creepiest. 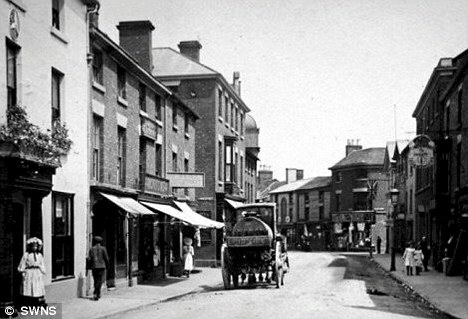 This proved true in the small town of Wem, England, when the destruction of a building birthed a creepy photograph of the supernatural. In 1995, a local man named Tony O’Rahilly took a photograph of a burning building and claimed to find the image of a little girl standing in the flames. O’Rahilly continued to assert the image’s authenticity until his death ten years later. How They Did It: In 2010, Brian Lear, another man from Wem, found a much older image that casts doubt on O’Rahilly’s assertions. In a 1922 postcard of a street in Wem, a girl standing on the sidewalk bears a remarkable resemblance to the ghost girl in O’Rahilly’s snap. Experts now believe that O’Rahilly used a double exposure technique to create the image, similar to the methods used in spirit photography. In 1935, a photo of a shocking new technological development emerged from Germany. The photo showed a German man, Erich Kocher, soaring through the air on skis, powered by breathing through a strange cylindrical machine. Newspapers around the world picked up the story and printed the photo, including the New York Times. How They Did It: April Fools! The world’s hoaxiest holiday struck with a vengeance more than eighty years ago when this April Fools joke got out of hand. Even within the article, there’s evidence of the fraud, but these jokes got lost in translation. The original international distributor of the photo got the man’s name wrong. In the original article, it’s Otfried Koycher, a pun on the German word keuchen, which means to wheeze. When the jokes got translated away, what was left was a real news article that may have fooled millions. One of the more recent sightings of the Loch Ness Monster, which made the rounds in 2012, revealed the most believable-looking version of the beast to date. Tour boat skipper George Edwards, captain of the Nessie Hunter IV, snapped this pic of the illusive beast. Prior to the photo, Edwards spent 26 years leading tourists around the Loch in search of Nessie. How They Did It: Despite orchestrating this hoax in the age of computers, the hoaxer’s methods weren’t digital at all. George Edwards finally confessed that he repurposed a fiberglass hump from a National Geographic Documentary about the Loch Ness Monster that he worked on the year before. He claims he did it as a joke, to poke fun at those Nessie hunters who value the science of the quest over the fun of it. Arguably the most famous ghostly photo, believers in the supernatural often cite the Brown Lady of Raynham Hall as the most conclusive photographic proof of ghosts ever taken. According to legend, the ghost is probably the spirit of Lady Townshend, whose husband imprisoned her in the estate for her infidelity. The ghost has been spotted lurking around Raynham Hall for centuries, although she was not captured on film until 1935. On assignment for Country Life magazine, photographers Captain Provand and Indre Shira snapped the photo that has since become a phenomenon. How They Did It: While there’s still no conclusive proof and probably never will be, experts like famous skeptic Joe Nickell believe that the photograph is just a result of two images layered together. 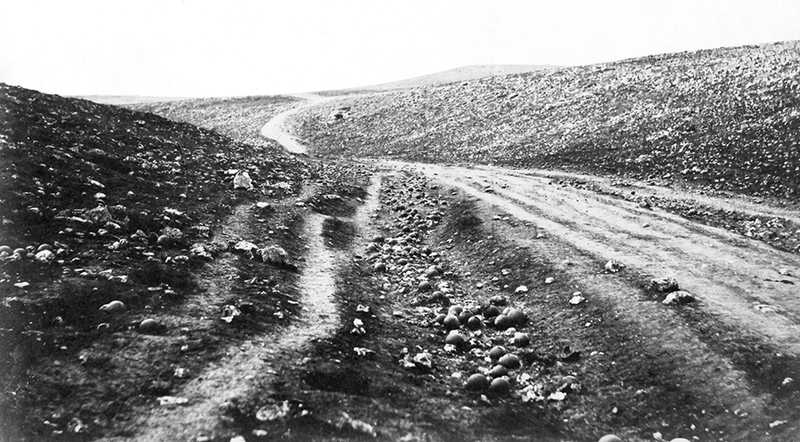 In one of the first war photographs ever recorded, cannonballs littered a lonely landscape. British photographer Roger Fenton created the image, called Valley of the Shadow of Death, during the Crimean War in 1855. The photograph has been displayed in multiple famous art museums around the world since its creation. How They Did It: The discovery of a second, similar photograph led to the downfall of Fenton’s credibility. The other version is almost exactly the same except for one thing – no cannonballs on the road. Experts set about examining the photographs against one another and discovered a minute detail that blew the hoax wide open: pebbles in the cannonball picture rested lower than the same pebbles in the non-cannonball picture. This led experts to conclude that the movement of the cannonballs into the frame dislodged the pebbles, which meant that the photograph was staged. To this day, one of the most prevalent conspiracy theories in American history involves the crash of an unidentified flying object in Roswell, New Mexico in 1947. In 1995, a man named Ray Santilli sold footage of an autopsy of the alien that landed in Roswell almost fifty years prior. The footage aired across the world, including on the FOX network. How They Did It: First of all, the UFO at Roswell has long since been identified. It was an Air Force Surveillance weather balloon. Yet, for almost 70 years, conspiracy theorists have been searching, debating, and creating answers for what that object might have been.After viewing the film, experts argued that the movement of the alien corpse resembled a dummy and that the doctors in the footage did not actually operate the way a real doctor would. A man in Manchester, England, has even come forward and admitted that he was hired by Santilli to create the dummy. Ten years later, in 2006, Santilli came forward with a half-confession: he claims that the footage is a recreation of actual footage provided to him by a military photographer. According to him, time degraded the footage beyond recognition. Despite all the hopes of Roswell conspiracy theorists, Santilli’s lies seem to be the only cover-up here. For over 100 years, the photo of Ulysses S. Grant perched atop his noble steed during the Civil War stood as one of the most iconic images of the era. Grant went on to become president, which made the picture even more influential. L.C. Handy, nephew and apprentice of famed Civil War photographer Mathew Brady, understood the value of a quality patriotic photo. He copyrighted the image after Brady’s death and began to sell it to nostalgic veterans. How They Did It: At the advice of a researcher, employees at the Library of Congress took a second look at the photo and began to notice some discrepancies. First, Grant was a three-star general at the time the photo was purported to have been taken, but in the photo he only has one star. Second, the horse Grant rode at the time didn’t have any white socks, but the horse in the photo did. Third, the photo shows a group of soldiers casually sitting with their backs turned to their superior, something that never would have happened during battle. In the end, researchers discovered that the print in question is actually a photo montage of three separate images: one of Grant’s head, one of another general’s body, and one of thebackground scene with soldiers watching a battle. Perhaps the photo on the list with the most mysterious past, this family photo popped up on the internet around 2009. The original photograph seems to have been published by itself, but over time, a story has surfaced about the origins of the photo. Apparently, the Cooper family in Texas moved into a new home sometime in the 1950s. The Cooper family patriarch snapped a photo of his wife, his mother, and his two sons. They developed the photo and the rest is spooky history. How They Did It: To date, an official confession or explanation has never been offered. However, experts examining the photo point out that the shadows on the body do not match the shadows in the room. They also point to the fact that the corners of the photo contain vignetting, a darkening of a photo that occurred on older cameras, but that the vignetting appears too symmetrical to be true to the photo. Therefore, experts believe the photograph to be the result of some tricky Photoshop skills, or perhaps a double exposure at the very least. When a photograph of a soldier being held at gunpoint appeared on a website commonly trafficked by Iraqi militants, the media went into a frenzy. Along with the photo, the post included text supposedly from the Mujahadeen Brigades referencing the capture of this soldier, named “John Adam,” and the murder of his fellow servicemen. The story broke around the world, despite the US military’s claim that no soldiers had gone missing in the area. How They Did It: Upon seeing the news story, a toy company named Dragon Models asserted that the soldier in the photograph bore a striking resemblance to “Cody,” one of their action figures. A week later, an unnamed Iraqi man took credit for the hoax online and posted a photo of the set-up, complete with the soldier and the tiny gun.